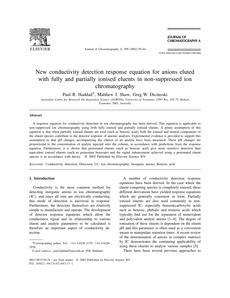 A response equation for conductivity detection in ion chromatography has been derived. This equation is applicable to non-suppressed ion chromatography using both fully ionised and partially ionised eluents. A prime assumption of this equation is that when partially ionised eluents are used (such as benzoic acid), both the ionised and neutral components of the eluent species contribute to the detector response of anionic analytes. Experimental evidence is provided to support this assumption in that pH changes accompanying the elution of an analyte have been measured. These pH changes are proportional to the concentration of analyte injected onto the column, in accordance with predictions from the response equation. Furthermore, it is shown that protonated eluents (such as benzoic acid) give more sensitive detection than equivalent ionised eluents (such as potassium benzoate) and the signal enhancement achieved using a protonated eluent species is in accordance with theory.